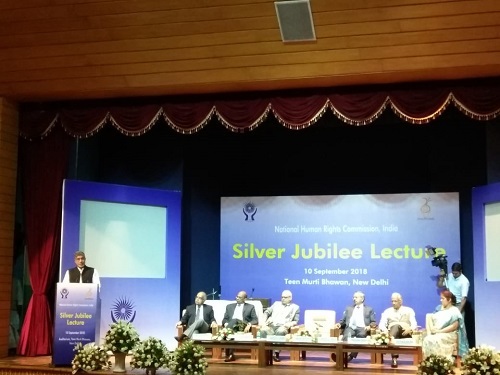 The National Human Rights Commission, NHRC, India in connection with its silver jubilee celebrations on 10th September, 2018, at Teen Murti Auditorium, New Delhi organized the lectures of three eminent persons, who have worked tirelessly in the field of human rights, They included: Mr. Kailash Satyarthi, Nobel Peace Laureate, Dr. Ajay Mathur, DG, TERI and Mr. Prakash Singh, Former DGP, UP. The Nobel Laureate, Mr. Kailash Sathyarthi and the founder of 'Bachchpan Bachao Aandolan', addressing the gathering as the Chief Guest, said that when the space for inconvenient truths and dissenting voices is shrinking, the country needs vibrant and independent institutions like NHRC, India and state human rights commissions. 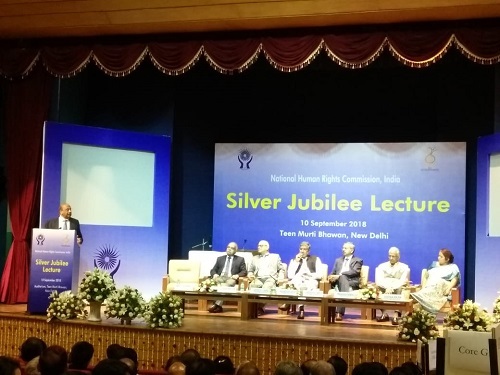 Congratulating the NHRC on its Silver Jubilee, he lauded the role of the commission right since its inception in 1993, towards the promotion and protection of human rights. He recalled his long association with NHRC, India and how its interventions gave support to his fight for the protection of the child rights in the country, on several occasions, including saving his life. He also recalled how the personal intervention of the former Chairperson of the NHRC, Mr. Justice Rangnath Misra and Member Mr. Justice V.S. Malimath ensured that the Government banned the employment of children as domestic help by the government servants. This later helped him take up the matter before the Supreme Court for banning the child labour in the country. He said that human rights are not just limited to enforcement of certain laws. We have to create a culture of human rights to live with human values which begins by respecting and tolerating each other and also respecting the plurality in our country. This is a responsibility cast upon all individuals and not just the governments, judiciary and statutory bodies like NHRC alone. He said that despite legislations, the challenges in the field of child rights have not ended in the country. The child trafficking and child labour still persist and needs resolute action by all stakeholders. Mr. Satyarthi expressed concern over the recently reported incidents of mob lynching on suspicion of child lifting and cow vigilantism. Mr. Prakash Singh, Former Director General of Police, UP and BSF, addressing the gathering, said that India followed the concept of human rights since ancient times, which is reflected in our Constitution and a number of special enactments to preserve and safeguard the basic human rights to life and liberty of every individual. He said that Government of India has been laying great stress on the observance of human rights by the security forces. But there have been some controversies from time to time in this context, be it over 2,500 writ petitions filed in the Supreme Court and Punjab and Haryana High Court against Punjab Police force after the defeat of terrorism in Punjab, resulting in huge demoralization of officers and men or the recent controversy in the backdrop of July, 2016 Supreme Court Judgment against the Armed Forces in the matter of alleged extra judicial executions in the 1990s in Manipur. Mr. Singh said that the voices of dissent coming from the Armed Forces in such a forceful manner have to be taken serious notice of, and the larger question of human rights in insurgency situations must be properly debated and discussed. He said that the absence of political consensus on fighting terrorism has adversely affected the country's capacity to combat terrorism. We need to strike a balance between the security concerns and the human rights considerations. It would be a sad day, if, at any stage, we win the battle of human rights but lose the battle to uphold the unity and integrity of the country. 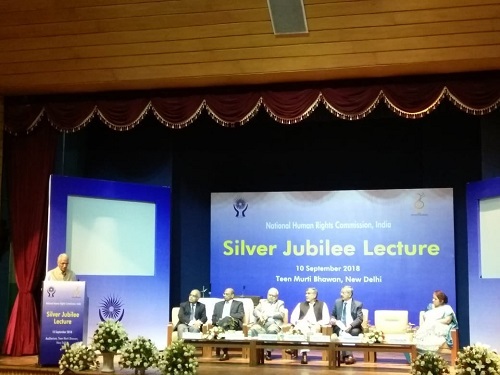 Dr Ajay Mathur, Director General of the Energy and Resources Institute (TERI) delivering the NHRC Silver jubilee lecture said that there is an immediate need to develop consensus on the causes and ways and means to ensure a clean environment for all, thereby ensuring human rights of all. He urged the NHRC, India to initiate a dialogue on the issue of right to clean environment, as a basic human right, to help build a common understanding on this issue, as well as the limits of these rights. The TERI, DG said that there is a lack of common understanding of how an objection will be dealt with, which claims for example, by the landfills site area, the air quality endangers the life and dignity of the people imparted by it though, it is probably a clear case of the violation of the human rights of the thousands of people, who live around the landfills. Dr. Mathur said that the concept of human rights, and violations thereof, is ever expanding and evolving, which may differ from country to country and time to time. The international bodies, including those under the aegis of United Nations and our domestic laws and interpretation of constitutional guarantees, through various judicial pronouncements, have underlined the right to clean environment as a human right. Lauding the role and contribution of the National Human Rights Commission, India in addressing in complaints of human rights violations, Dr. Mathur said that the NHRC, India as well as similar Commissions across the world, reflect the reality that rights relating to life, liberty, equality and the dignity of the individual are often not adequately met. Earlier, the NHRC Chairperson, Mr. Justice H.L. 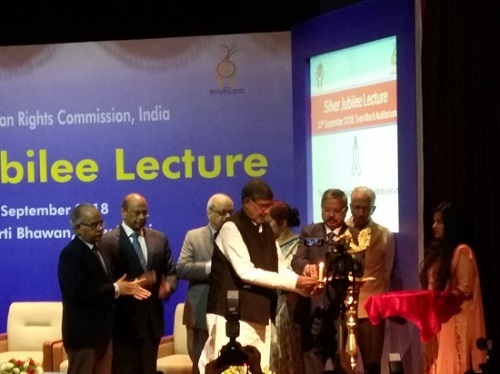 Dattu said that the Commission is celebrating this important milestone with a series of events, of which these lectures were an important part. The Commission has been involved in efforts to address the issues of extra judicial killings, prison conditions, bonded and child labour, and the protection of vulnerable groups, including women and children, persons with disabilities, and the elderly, among others. Justice Dattu said that the Commission has also been making efforts to spread human rights literacy among various sections of society and government, and promote awareness of the safeguards available for the protection of these rights through publications, the media, seminars and other available means. More recently, to further spread the message of human rights protection, the Commission has developed an 'Online Human Rights Pledge' hosted on the My Government portal of the Government of India which is open to both individuals and organisations to sign. The NHRC Chairperson said that the Commission has tried to reach out to people from all walks of life, including those living in the remotest parts of the country. The fact that the Commission has indeed been able to extend its reach across the length and breadth of the country can be gauged from the phenomenal increase in the number of complaints received each year. Recalling the contributions of Mr. Kailash Satyarthi for the protection of child rights, Dr. Ajay Mathur for his contribution in the field of environment rights with the rights prospective and Mr. Prakash Singh for his invaluable contribution to police reforms in India, the NHRC Chairperson stressed that a true commitment to human rights will require concerted efforts to nourish and treasure the rich diversity of all people and the natural environment and developing and sustaining mutually-enabling relationships.